I don't exactly know what they define as an "incident" (A bust? An explosion? A single guy spotted tweaking out on the street? ), but apparently, I'm not the only one in a meth state. And for the ninth straight year, Missouri had the most, with 1,774 incidents, up 19 percent from 1,487 the previous year. An “incident” includes meth lab busts but also any documented evidence of meth-making, authorities said Wednesday. Indiana had the second-most meth lab incidents with 1,096, followed by Kentucky with 583, Mississippi with 577 and Michigan with 511. That's right, SadBears: Our states (and those of our associates) are apparently meth-riddled hellscapes. Only Virginia is spared the wrath of a meth explosion. See chart here- the Show-Me State still has 700 more than the Hoosier State, and nearly TWO TIMES more meth than third-place finisher Kentucky. 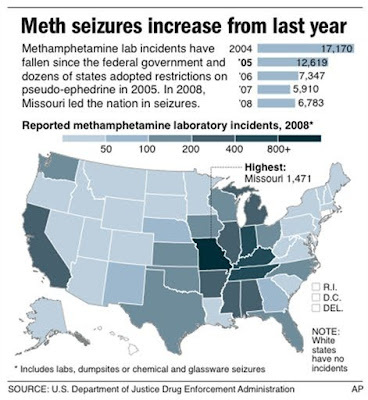 Never mind the fact that more than half of Missouri's meth "incidents" come from two counties— we'll just have to take our "meth capital of America" title with pride. At least we don't contain the nations "murder capital" or "highest rate of black homicide victims." Also relevant, via Econ: Our nation's "favorite drugs"
PS Is it weird that we already have a tag for "meth"? Also, if you couldn't tell, I actually like Missouri... and I think a lot of the statistics they present don't tell the whole story. Like the fact that Frankin and Jefferson Counties have such a large proportion of meth busts that they bring the whole state down. Things like that. Nice post. A lot of these infographics are pretty cool looking, too. I think it was the other day in circuit court, during a sentencing hearing, where I decided I wanted to do a bigger piece on meth in the county I cover. It's such a crazy drug...and what it does to people...Jesus. I should note that the infographic title "Our Favorite Drugs" isn't completely accurate. The chart doesn't reflect drug use, incidents, or arrests. It reflects which drugs law enforcement consider to be the greatest threats in their area. Also, the typeface might lead you to believe this is from Reason Magazine, but I don't believe it is. Also related: Feds consider Saginaw, Michigan, the #1 most violent U.S. city per capita.